This in depth article explains the requirements of some of the typical calibration and performance testing requirements of gas detection equipment. Gas detection equipment and associated devices play a substantive role in the management of potentially hazardous environments. With differing gaseous environments present in both industrial and domestic applications, manufacturers of gas detection equipment need to ensure their products meet stringent testing criteria to operate safely and reliably. Toxic gases such as hydrogen sulphide may be encountered in the working environment. Odourless at lethal concentrations, there are many applications for hydrogen sulphide sensors, such as in the field of occupational safety in mining, the petrochemical industry and industries that deal with organic waste. Carbon monoxide monitoring is particularly important in environments where solid, oil or gas appliances are used. Carbon monoxide sensors are predominantly of electrochemical design for the lower concentration applications, and of the infrared photometry principle for the higher concentration ranges. While detection at parts per million (ppm) levels, from 10 ppm up to 330 ppm, is required in domestic applications, much higher carbon monoxide concentration ranges, in the percentage region, are required for the automotive industry. The electrochemical cell design for carbon monoxide detection is robust and cost effective, but these sensors can lose sensitivity when exposed to high carbon monoxide concentrations. During the calibration of these systems, the engineer must be mindful to allow sufficient recovery time following exposure to high CO concentrations. Ambient humidity with electrochemical cells is also an important factor in their performance characteristics. Relatively short exposure to dry test gases, as is normally required during calibration work, will not adversely affect the sensor. It is important to remember, however, that long exposure to dry conditions can dry the sensors and lead to a reduction in their performance. 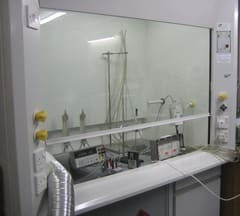 As the reaction in the electrochemical cell is the oxidation of carbon monoxide to carbon dioxide, the calibration gases must contain a sufficient level of oxygen. Sensors based on infrared photometry are not subject to the same issues with exposure to high concentrations of carbon monoxide or exposure to dry conditions. These are, however, more complex in design and more expensive. Detectors for hydrogen sulphide are predominantly of electrochemical cell design, working on the principle of the electrochemical oxidation of hydrogen sulphide. Detectors working on the principle of electrochemical oxidation are capable of measuring hydrogen sulphide down to parts per billion levels. Care must be taken to avoid these sensors becoming contaminated with gases that may be absorbed onto the active surface of the cell, such as heavy oils. Certain airborne chemicals may react to produce by products that may inhibit the chemical reaction within the cell. Other technologies used for the detection of hydrogen sulphide include optical sensors, semiconducting metal oxide sensors and conducting polymer sensors. The reactivity of hydrogen sulphide with metals such as iron is an important consideration with regard to the design of the equipment used to calibrate and test these sensors. The surfaces and internal workings of sensitive equipment such as gas blending devices can quickly corrode if not constructed with the right materials. It is also important to bear in mind that such reactions will lead to a reduction in hydrogen sulphide concentrations, introducing an element of uncertainty into the calibration or testing of the sensor. Many gases used in industry can pose a flammability risk if leaks occur. Gas sensors are generally set to provide an alarm at gas concentrations that are far below the lower explosion limit (LEL) concentration. This provides time for the user to mitigate any potential explosion risk. Of the technology in the current market, infrared photometry and catalysed bead pellistor technology predominate. The concentration ranges normally applicable to these devices is in the percentage range, with a typical device reading over a span of zero to 100% of the LEL for a particular gas. Pellistor technology is robust and cost effective, but the catalytic bead of the pellistor may become desensitised by exposure to gases containing silicon, lead, sulphur, phosphorous and halogens. They may also become desensitised by exposure to high concentrations of combustible gases and some heavier hydrocarbons. As the reaction involves the oxidation of the combustible gas, test gases must contain a sufficient level of oxygen. It must also be noted that pellistors are non-selective, and will give a response to any combustible gas. For pellistor-based sensors the response curves vary significantly between different gas types. It is therefore important to match the calibration gas type to the application for which the unit under test is to be used. Pellistor based systems are prone to certain poisoning effects; however, for practical purposes, this does not affect the infrared photometry. Atmospheric water vapour can have an interfering effect on infrared based systems. In laboratories that perform the testing and calibration of gas detectors, ambient conditions are kept within strict relative humidity and temperature limits, thus the effects of water vapour interference during calibrations do not present an issue. The infrared photometry technique is used in open path gas detection. Open path systems are widely used in the petrochemical industry to detect gas leaks that might occur across large areas of the plant. In this technique, an infrared beam is projected along a path of a length that may be up to a few hundred metres. The open path sensor is linked to an alarm or a gas shut off device, which is set to trigger should the infrared beam be attenuated by the presence of leaking gas. Of the multitude of volatile organic compounds (VOCs) that may be present in workplace environments, many have exposure limits at parts per billion levels. These compounds are associated with paints and coatings, refrigerants and cleaning materials, as well as solvents and starting materials used in industrial processes. Sensitive analytical techniques are required to reliably detect these compounds. Techniques employed for the detection of VOCs include, among others, photo ionisation detectors and techniques based on mass spectrometry. Both oxygen depletion and oxygen enrichment are important considerations in many industrial settings. Confined areas that may have depleted oxygen levels pose a significant risk. There have been many recorded fatalities due to workers entering confined areas of low oxygen levels. A reduction in local oxygen levels can be caused by the ingress of other gases, or by local chemical reactions that may have depleted oxygen levels. Oxygen enrichment, for example, from the leaking of oxygen cylinders used in welding, can pose a significant flammability risk. In general, sensors for the detection of oxygen enrichment or depletion are set to alarm at only a few percentage points above and below the normal ambient oxygen level of 20.9%. Of the currently available technologies, electrochemical oxygen cells are the predominant type of sensors in use. One of the characteristics of liquid electrolyte galvanic oxygen sensors is that their response is perturbed by sudden changes in air pressure. It is therefore important during the application of calibration gases to these devices to avoid pressure changes at the cell interface. There are other technologies available for oxygen detection. These include solid electrolyte high temperature oxygen sensors, paramagnetic oxygen analysers, and pulsed fluorescence quenching analysers. An important consideration in calibration is the gas type. This should be chosen to reflect the kind of gas to which the sensor is required to respond in the event of a gas leak. For example, a flammable gas sensor intended for use around gas appliances that run on natural gas should be calibrated with methane. If the appliances run on bottled gas, then calibration with propane or butane as appropriate is to be employed. Calibration range is also important, and the concentration range of gases to which the sensor is calibrated against must be appropriate to the alarm set point of the sensor. Another important consideration is the isomeric characteristic of the gas. The term butane, for example, refers to two isomers: n-butane and isobutane. Flammability characteristics and detector response curves also differ between isomers. It is also important to employ an appropriate calibration frequency. This should be based on knowledge of the drift characteristics of the sensor. The type of testing is a crucial part of the performance verification and the certification process for gas sensors. In general, the sensor will be tested to the environmental conditions under which the sensor will be required to operate. A typical testing programme based on the European standard for gas sensors would begin with the sensor being exposed to 24-hour periods of extremes of temperature, ranging from -25°C to +60°C. The purpose of the initial conditioning is to ascertain whether the sensor can withstand the kinds of ambient temperatures to which it could be exposed during transit. For example, if the sensor is transported across Siberia in winter, will electrical connections within the device become brittle enough to break? Or if the sensor is to be transported in the tropics, will the heat damage the sensor? The ability of the sensor to be successfully calibrated, and for the sensor to remain within calibration limits is ascertained. To this end, a sensor is calibrated, and the calibration is regularly checked over an extended time period. Alarm set points are then checked for their response to increasing and decreasing concentrations of the test gas. The sensor’s performance under extremes of temperature, humidity, ambient pressure and wind velocities is also ascertained. 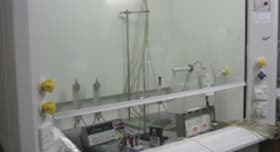 In the case of temperature and humidity, test chambers are used to provide conditions of low humidity and low temperature, as well as high humidity and high temperature. Specialised wind tunnels are used in order to expose sensors to a standard test gas at air velocities up to six meters per second. Other characteristics of the sensor are also checked, including the effect of sensor orientation, effects of external vibration and impact, warm up time, and the time that the apparatus takes to respond to a gas leak. Of fundamental importance to the effectiveness of a sensor is its sensitivity to variations in its power supply. The sensor is tested at both extreme ends of the power supply range to which it will be required to operate. The robustness of a sensor to influences such as electromagnetic interference, corrosive gases and dust are determined. The performance testing will also include a software evaluation. Regulations that effect gas detector performance testing differ between markets; however, national and international standards all follow the same rationale with regard to performance testing. There are many commonalities, for example, among the US, Canadian and European markets with regard to performance testing requirements. For combustible gas detectors, the Canadian market requires testing to C22.2 No 152-M1984 and the US requires testing to ISA 12.13.01. The performance requirements of these standards are required to meet certification to CEC Section 18 and Annex J and NEC 500/505 in Canada and the US respectively. For equipment requiring certification to European, US and Canadian standards, performance testing against IEC 60079-29-1, C22.2 No 152 and ISA 12.13.01 are therefore required. For domestic CO detectors, Canada works against CSA 6.19 and the US works against UL 2034. Equipment for the European market would require IEC/EN 50291. A comparison of IEC/EN60079-29-1:2007 and the US standard ISA 12.13.01 shows that equipment which has undergone testing to the IEC/EN standard will also have undergone the same testing required of the ISA standard in the tests, which includes testing of unpowered storage, calibration curve, response to different gases, temperature, pressure, humidity, air velocity, flow rate, orientation, vibration, drop test, warm up time, time of response, minimum time to operate, high gas concentration above the measuring range, battery capacity, and power supply variations. Conversely, a comparison of the IEC/EN60079-29-1:2007 and Canadian standard C22.2 No 152-M1984 shows many differences. The Canadian standard incorporates a bounce test that is not in the IEC/EN standard. Many of the testing conditions are different; for example, the temperature and humidity tests use values that are outside of those used in the IEC/EN standard.